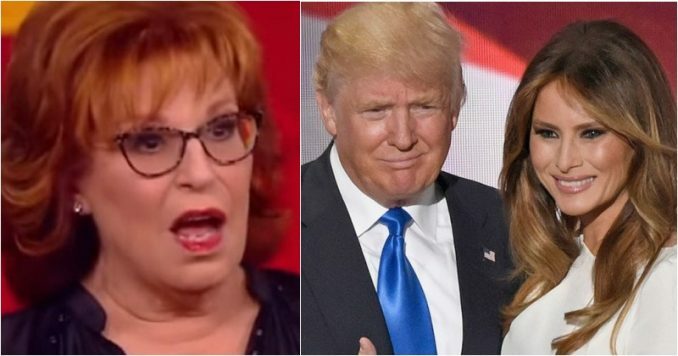 Joy Behar is making crazy allegations against First Lady Melania Trump. This isn’t the first time the 76-year-old talk show host trashed Mrs. Trump. Behar claims the first lady finds her role so mundane and hates her husband, she has employed a body double to do her duties as FLOTUS, showing the ABC audience pictures. Well, that’s when President Donald Trump dropped a truth bomb that the former comedian never saw coming. You’ll love this. Joy Behar and her cohorts on The View opened up their Monday morning show with an entire segment on Melania Trump. Out of all the topics in the world, the shrews of The View could pick from, trashing our beloved first lady is how they spent their airtime. Joy and her pals claimed Melania couldn’t be bothered going to visit the poor victims of the tornado in Alabama, so she sent a body double. Big mouth Behar went on to say that “when there are rumors like this, it catches on because there is an element of truth. She doesn’t want to spend time with him.” That caused the shrews to erupt with laughter. As if they have intimate knowledge of the Trump marriage. It was utterly pathetic. Can you imagine if they were talking about Barack and Michelle Obama? They would be summarily dismissed from their TV gigs and fried on social media. And this isn’t anything new for ole Behar. Just last September, the Trump-hater went nuts when Melania’s parents became American citizens. Well, President Trump was questioned about leftists spreading these rumors about the first lady, and he put them all to shame. “Yes, our great first lady, who people love by the way. Well, if I were a Democrat instead of a Republican, she’d be ‘Jackie O’ times twenty. Instead, they go after her,” said the president. Trump was referring to President John F. Kennedy’s wife Jacqueline Kennedy Onassis — frequently nicknamed “Jackie O” after she became a world-famous celebrity and fashion icon in the United States. In fact, Melania’s style as the first lady is most like the late Jackie Kennedy. Something the Trump-haters really hate to admit. While overseas, Melania was gushed over by the European press as the new “Jackie Kennedy.” They know real style and class when they see it. Yet, the president is right. Here in the United States, the press refuses to give the first lady, who exudes only grace and dignity wherever she goes, one iota of respect. Shame on Joy Behar and her merry band of Trump-haters. They sound like a bunch of jealous hens cackling and clucking up a storm over the beautiful first lady. None of them can hold a candle to the first lady, and when history is written no one will remember them. But Melania Trump will go down as one of the most classy and graceful first ladies America has ever had.